The useful spectrum of collaborative working helps get our heads round the easier as well as the more challenging activities. Sharing information is a great way to begin - but surprisingly hard for some organisations which have a defensive approach. Yes, commercial confidentiality and data protection are legitimate reasons for not sharing. And some data handling systems mean that putting information in a form which can be shared and made sense of by another organisation can be a real barrier. But don’t let these things be a reason for not exploring what information each organisation holds which the others can benefit from. If it’s useful enough to the collaborative endeavour, then ways can be found to share information. Coordination is the next level up - this will be either avoiding duplication, or duplicating on purpose. If you are going to clear invasive alien species from a river bank, it may make sense to avoid the annual regatta. Cooperation means working together - it may make sense to time the balsam-bashing for a fortnight later and use the regatta to recruit volunteers and let people know what you’re doing. The boat club might even come too. The next level needs a bit more commitment - a one-off project or even a substantial initiative which wouldn’t have happened otherwise, and is thought-up, managed and even funded jointly. The amount of input needn’t be exactly equal, but the collaborators are jointly responsible for making it a success and feel a sense of ownership. More committed still than a one-off event or product is to collaborate on delivering a long-term mainstream service. This is about changing how an existing core service is designed and delivered, and it means sharing (i.e. giving up) control of something which, if it fails, will be seriously problematic. So it’s no wonder that it takes longer to build up the knowledge and trust on all sides and that this manifestation of collaboration is rarer. Notice that this is not about sub-contracting - although sub-contractors can and do work very closely with clients in some situations, that’s not what we mean when we talk about collaboration. The special features of collaboration come into play when all the collaborating parties have equal freedom to walk away but don’t, because they are all getting something they really want from the collaboration, and they can’t achieve it without collaborating. And finally we get to mainstream strategic collaboration - not just for operational matters but as the new ‘business as usual’ for a core part of the organisations’ missions. This feels to me like the sort of multi-agency close working which comes into play with child protection issues - or is intended to. As you can see, on the left are the less demanding forms of collaboration, which have a lower level of collaborative advantage. As you move towards the right hand side, the effort goes up, and so does the potential benefit. 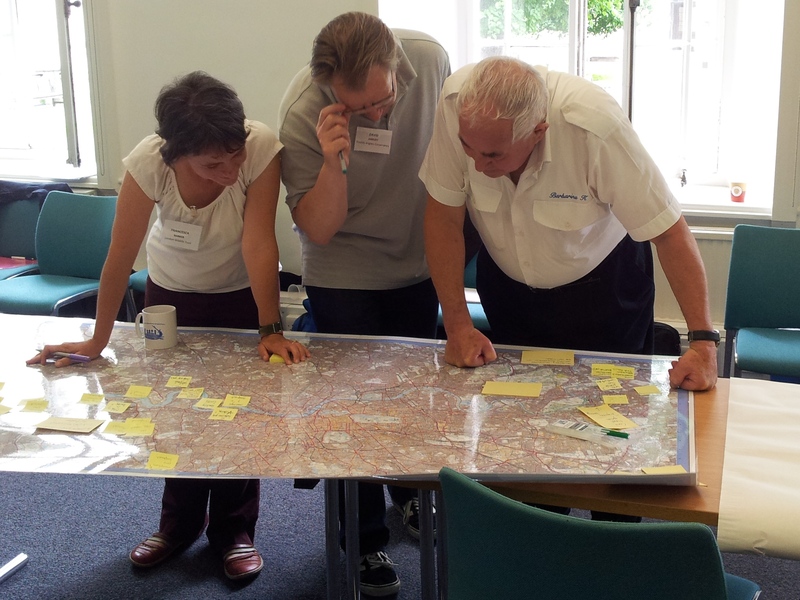 And what inspiring outcomes they are providing people find that collaborative advantage! Protecting and maintaining ecosystem services, dramatically reducing poverty, limiting global temperature rises.... If the outcome is sufficiently compelling for the collaborators, and the wickedness of the problem demands it, then collaboration is likely to move towards the right-hand side of the spectrum. But don’t be misled. The right-hand of the spectrum is not an ideal or goal. Horses for courses, and all that. It’s not that one kind of work, or kind of partnership, is better than the other: what’s important to recognise is that you and your fellow collaborators need to discuss your options and agree what you want to do together, rather than assuming that your work will be of one kind and discovering later that others have a different assumption. So bring the spectrum to one of your collaborative workshops and see what your (potential) collaborators think about where you are all working now, and whether that needs to change. This post was first published on the 2degrees website. 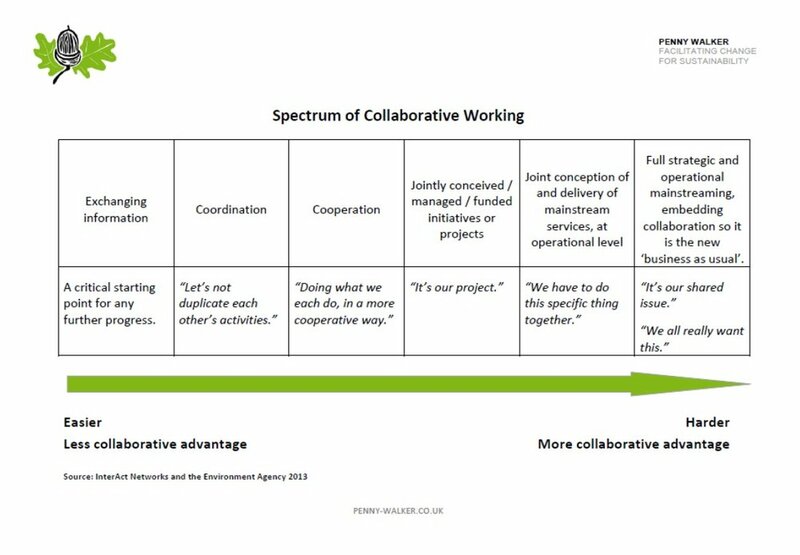 The spectrum of collaborative working is just one of the many useful tools and ways of thinking about collaboration, that are in my book Working Collaboratively: a practical guide to achieving more. You can buy it on the Routledge/Greenleaf website.